A meeting intended to seek solutions to the ongoing fees protests had to be called off after demonstrators, for a second day, poured human waste on the floors of CPUT’s sports hall. 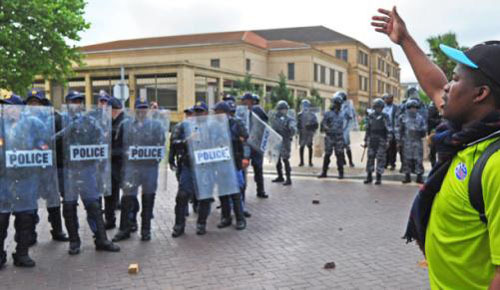 CPUT stands for Cape Peninsula University of Technology in Cape Town, South Africa, where “students” have been throwing rocks, bricks loosened from university buildings, and feces at the police. The smell of human excrement and teargas filled the air as the students were forced to retreat. No classes are being held at CPUT these days. Alert security guards at the Pietermaritzburg campus of the University of KwaZulu-Natal have been hailed for preventing the almost certain destruction of property by finding and removing 12 Molotov cocktails and two five-litre containers of petrol from a student residence. The discovery came after an upsurge of violence at the Pietermaritzburg campus on Wednesday night, when a small group of rioting students started fires on Ridge Road and discharged firecrackers in lecture venues. The university’s Risk Management Services (RMS) and private security operatives hired by the institution on Thursday morning found the petrol bombs and containers of petrol at the Malherbe residences on Alan Paton Avenue. This was the same residence from where students clashed with police in a violent exchange of rubber bullets, tear gas, stun grenades and large rocks two weeks ago. Damage to UKZN property has already topped R60 million ($4,306,416 US). This figure will rise sharply when a future batch of Molotov cocktails gets used. At about 18.30 on Wednesday, a group of about 40 students disrupted a test at the Student Union exam centre on the main campus. A source at the university said a test due to take place at the Petrie dining hall was cancelled by a lecturer after the violence erupted. Other favored tactics to prevent learning include setting off firecrackers at lecture venues and setting things on fire. There is talk of classes and exams for the current semester getting pushed into 2017. Before long educational equality will be achieved by the only means possible: limiting everyone to a lowest common denominator of total ignorance. If the trends of the past few decades continue, the rest of the West will follow South Africa into a bleak, short future. What they have instead of classes at CPUT. On tips from ABC of the ANC. Cross-posted at Moonbattery.